Glenwood Canyon is 12 1/2-mile-long scenic wonder, with the Colorado River running through the bottom and canyon walls of granite and limestone that rise up to 1,300 feet above the river. It is the largest canyon on the upper Colorado. The canyon stretches from Glenwood Springs, where the Colorado meets the Roaring Fork River, east to Dotsero, where the Colorado meets the Eagle River. In 1906, the canyon was chosen for the gravel Taylor State Road, which was the first route to take cars through the Colorado Rockies. Today, the canyon is traversed by Interstate 70 and the California Zephyr passenger train. This stretch of I-70 was not completed until 1992, after 12 years of construction and decades of battles between roadbuilders and environmentalists. 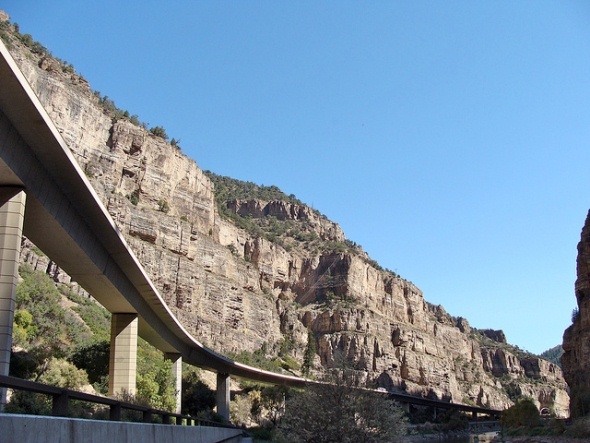 The canyon route includes No Name Tunnel, Hanging Lake Tunnel, Reverse Curve Tunnel, 40 bridges and miles of retaining walls. Eastbound lanes are cantilevered over the Colorado River, and westbound lanes are suspended on a viaduct. To add complication, the original Denver & Rio Grande Western rail line was also crowded into the delicate natural area, and the highway had to be built without disturbing the historic train route. Trains have traveled through the canyon since 1887 and continue today to provide inspiring views from the windows of the viewing car of the California Zephyr. In 1968, the Legislature passed a resolution directing the Colorado Department of Highways to make I-70 a “tasteful blend between ‘the wonders of human engineering’ and the ‘wonders of nature'” The resulting plan used three tunnels and 39 bridges to wind the highway through the canyon and “balanced cantilever construction” that involves the use of a crane to drop in precast sections of a bridge from above, once a pier is built from the ground, and had never previously been used in the United States. A federal judge in 1984 rejected a lawsuit by the Sierra Club and Colorado Open Space Council seeking to block the project but required construction crews to disturb as little of the canyon as possible. The project proceeded with extraordinary care. While the four-lane highway was under construction, frustrated travelers had to share one lane, trading between west and east every half hour. When it was finished, at a cost of $490 million ($800 million today), the project had totaled 40 times the average predicted cost per mile of the interstate highway system. But, the Glenwood Canyon section won 30 awards for its beauty, functionality and inventiveness. The I-70 project added a bicycle trail through the canyon and retained access to Hanging Lake and key rock climbing and ice climbing routes. The highway was routed across the Colorado River and into tunnels at Hanging Lake so that it is concealed from hikers.